I recently had the opportunity to participate in the Women in PT Summit held in New York City. Industry leading Physical Therapists from all over the country engaged in the event both in person and online. I became acquainted with new people, exchanged business cards, and had many great ideas for collaborating with those I met down the line. With PPS 2017 on the immediate horizon, I’m rethinking those networking moments and asking myself: What did I do wrong? What did I do right? And, what do I still need to do to ensure that this upcoming conference becomes as successful as it can be? During the fall months, PTs from around the world will gather at the Private Practice Section Annual Conference & Exhibition for the most acclaimed networking opportunity of the year in the physical therapy industry. How do PTs prepare for a networking opportunity of this caliber? How do you execute that plan while you are onsite, and what does the follow-up process look like? Like every other successful business strategy, a systematic approach to networking will ensure that you are successful. This formula can be as involved or as simple as your schedule can afford; but if you complete all of the following steps, you can be certain that your networking efforts will be worth your while. 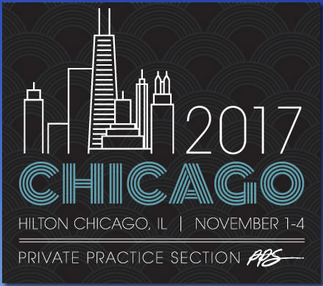 Prior to PPS 2017, the Private Practice Section will post a list of attendees, course descriptions, and speaker information. Take some time to look through this content. Identify speakers in courses focusing on skills that you would like to develop. Read their bios, google them, learn about their accomplishments. Use the attendee list to identify therapists in your region or practice area who might benefit from a collaborative relationship with you. Learn enough about them to know what questions you would have for them in a face-to-face interaction. On that attendee list you are investigating, you will see your own name. Will other Physical Therapists see your name and want to connect with you? If you are a young PT, or if you are struggling and only focused on networking because you are seeking a mentor, that is OKAY. There will be innumerable seasoned PTs at the conference who are ready and willing to pay-it-forward to those looking to be a mentee. However, if you have something to offer, make sure you put it out there! Spruce up your LinkedIn page, your website, and make sure any online and social media bios are current. Share articles and knowledge on Twitter and LinkedIn where physical therapists meet in professional circles. That way when they see you on the attendee list, or in the conference app, they will know they want to meet you. All too often we go to a conference and expect the storied, life-changing networking opportunities to fall into our laps. If luck works in your favor, you may find this method effective. However if you plan to connect, you can increase the likelihood that you will have worthwhile networking experiences. To echo President Dunn, the key word here isn’t connect, it’s plan. Decide now that you are going to reach out to conference attendees, and make a plan for how you are going to do it. The conference app is a great resource for making a plan to connect onsite. Attendees have the option to share contact cards, schedule meetings, and send private messages inside the app before, during, and after the conference. Don’t be shy! Put yourself in Stacy’s shoes. She isn’t going to be bothered, she is going to be flattered. People have a tendency to engage when you take an interest in them. One of the most important pieces of building a relationship that lasts, is follow-through. How often do we say, “We should grab coffee sometime,” or “I’d love to stop by your clinic when I’m in town,” and then repeat that statement to one another for years without ever following through. Only make a suggestion if you mean it, and if you mean it, follow through. If you want to make something happen, you have to plan for it. When you say the words, “We should…” Stop. Pull out your phone, and either schedule that event, or send yourself a reminder to reach out in a couple of weeks to make a plan. When that reminder comes in two weeks, actually make a plan. If you are too busy in the moment the notification arrives, drop the reminder on the next calendar day. If you let it pass you by, it could be weeks, months, or even years before you finally follow through. Be proactive about fostering relationships now that will be useful to you in the coming year. If you make it to Step 5, congratulations! You have successfully engaged with another conference attendee in an intentional, meaningful way. If it turned out to be the positive interaction you were expecting when you scheduled the meeting, don’t let your progress come to a halt. Continue fostering a relationship with that person by repeating steps one through four. Research them by following them on LinkedIn and Social Media. Continue to Get Noticed by sharing insights, articles, and ideas that would interest them. Make a Plan to Connect with them again when the timing is right. If they live nearby, set a calendar reminder to follow up with them in a month or two. If they are far away, utilize that attendee list again at next year’s PPS conference to reach out to them and schedule a meeting. Finally, Follow Through. This is the step that takes peer associations from coffee shops to collaborative power teams. If it’s a relationship that will count, keep pushing repeat on the 5-step networking formula and guarantee results. When following these 5 steps, the connections you shape, will serve you both personally and professionally. Every interaction you have is a networking opportunity. PPS, the Women in PT Summit, and other conferences you attend are jam-packed with events where you can exercise your networking skills; but your day-to-day contacts will develop into more meaningful relations too if you plan to invest in their growth with as much dedication.